Orlando, FL., January 18, 2016 – Coming off a tough, hard earned win earlier in the day against former Tampa Bay Devil Rays’ pitcher Esteban Yan, Miguel Garcia’s Coral Gables Athletics needed to put together one more solid performance before making the trip back down I-95 towards south Florida. Going up against a Chicago Rippers team coming from near freezing temperatures, which the city was hovering around 10 degrees with the wind chill factor, the Athletics were able to cool down their opponents from Illinois. Garcia tabbed Robinson Cancel as the team’s most valuable player for the tournament, as the extra hitter went 3-for-3 with a run batted in and a walk en-route to Coral Gables topping Chicago 6-3 Monday afternoon on Martin Luther King Day. Chicago opened up the bottom of the first inning with the initial scoring, as Jermey Spears started off the inning with a walk and Dom Biagini hit a routine fly ball to Athletics’ center fielder Juan Quesada, who committed an error and dropped the easy out, which put runners at first and second. Third baseman Anthony Feliciano hit a single to left field, which scored Spears from second base. Biagini scored on the next at bat of Karl Lundholm, who singled to right field and gave the Rippers an early 2-0 lead. Coral Gables did have a response to Chicago’s runs, when in the top of the second inning Cancel ended up scoring on an Ulpi Fuente’s single and cut the deficit to 2-1. For the next three and a half innings, both teams stalemated and pitching would take over as five hits were scattered but no runs came seriously close to crossing the plate. The Rippers scored their final run of the game in the top of the sixth when Lundholm tripled home Biagini, who walked earlier in the inning. Lundholm’s second RBI gave Chicago a seemingly commanding 3-1 lead heading into the last three and a half innings of play, but Garcia’s group was no where near ready to give up on its quest for a fourth overall championship. Garcia’s club began the comeback trail in the top end of the seventh, when a walk of Jose Zabala and Luis Rodriguez single put two runners on to start off the frame. A fielder’s choice on a ground ball by David Espinosa scored Zabala and put the Athletics down 3-2. The top of the eighth was when Coral Gables would fully complete its comeback. Cancel scored the tying run on a single to left field by George Hassell, who would later score the go-ahead run on a passed ball during the at bat of Albert Jardiner. 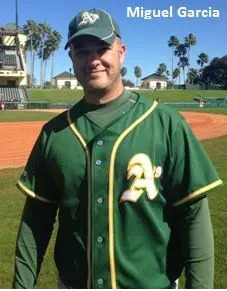 The Athletics, armed with a 4-3 lead, left the rest of the game pitching-wise to Jason Privett, who struck out three batter and allowed three hits and no runs on three innings of work. Coral Gables tagged on a couple insurance runs in the top of the ninth inning to help secure back to back championships in the 18 and over division.